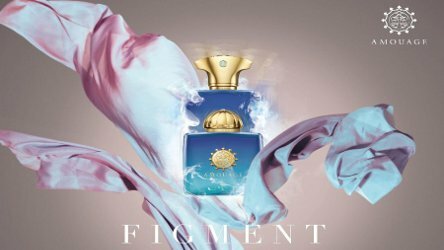 Perfumers Dorothée Piot and Karine Vinchon-Spehner developed Figment Woman. Its notes include Sichuan pepper, saffron, gardenia, tuberose, jasmine sambac, orange blossom, lisylang (a fractionated ylang ylang), cassia, orris, papyrus, patchouli and incense. Here’s Kevin’s review of this one’s partner, Amouage Figment Man. To me, Figment takes gardenia and tuberose, and instead of giving them the full-on Elizabeth-Taylor-in-an-island-garden treatment, eases out the flowers’ scent components, polishes them up, then reassembles them in a different way. So, rather than smelling the textbook tuberose-gardenia combo, you smell the snap of green beans, a waft of euculyptus, and an earthy, almost intimate, truffled note. Yet, it still smells like white flowers — but through the back door. The tuberose-gardenia is framed with an interesting assortment of supporting characters that I don’t usually think of as tuberose’s pals. Cinnamon pops up, and I like it. It doesn’t smell gourmand at all, but it adds a subtle — really subtle, you have to pay attention to pick it up — and spicy frazzle to the fragrance’s edges. Figment has a minty whiff, too, but saffron gives it a “personal,” skin-like air that helps make sure Figment never smells like a guest bathroom soap. If you’re wondering if Figment Woman has the incense-patchouli feet of many Amouage fragrances, it doesn’t, despite being listed in its notes. Figment Woman’s sillage is meaty, and as it dwindles over time, it doesn’t go woody or sweet — it keeps its non-traditional floral character. It lasts about five hours on my skin before it’s quiet enough that I’m ready for a refresh. I like what Amouage is doing with their fragrances lately.3 Despite their overworked, yet heinously clumsy copy — stop it, Angie! — the fragrances don’t pander to the market. Amouage Myths Woman was a jolie laide perfume, and so is this one. To me, that makes them so much more interesting than something that’s merely pretty. Figment Woman isn’t my style, but if it’s yours, you’ll find lots to explore in it for wearings to come. 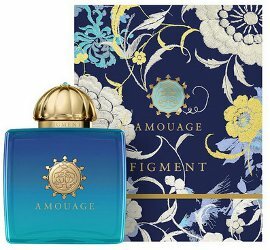 Amouage Figment Woman Eau de Parfum is $315 for 100 ml. For information on where to buy it, see Amouage under Perfume Houses. 1. L’Artisan Parfumeur Nuit de Tubéreuse is the grandma of this genre. 2. If you want to know more, you’ll have to look up the copy yourself, because I’m ashamed of the snark it brings out in me. 3. Except for Beach Hut. Ugh. I’m expecting a 10 ml decant so I’ll have an opportunity to text this one thoroughly. I find I’m not enamoured with tuberose but I do love Amouage so we’ll see! Of the newer ones I haven’t tried Myths yet but I do love the Lilac Love one for its heliotrope sweetness. I’d love to know what you think of Figment! I haven’t tried Lilac Love, but I do like heliotrope. It’s so comforting. I quite liked this one initial sniff and for the first 15 minutes was charmed. But it didn’t progress for me. After about an hour of the same thing, I was starting to get alarmed. I liked the smell, it just wasn’t going anywhere; it still smelled the same to me as during the first 15 minutes, which suggests powerful aromachemicals. After four hours, I was looking for somewhere to hide. Maybe all tuberose scents are like this, a la Fracas. It reminds me a bit of a few of the Bottega Veneta scents, or perhaps a Rufus Wainwright concert: the droning eventually becomes suspicious. It’s not the only Amouage to have this problem. Bracken Woman is the same, only I sort of enjoyed Bracken and I didn’t like this one at all. Funny your comment about Fracas, that does show development to me, and so do Carnal Flower and Tubéreuse Criminelle. Mind you they have a lot of presence, but at least to me are not as linear as this one was. Now that you mention it, I liked the beginning of Bracken Woman, too, but it *is* the same: after a while, much of a muchness, lasting and STRONG. Maybe this is the new Amouage house style. OTOH, I definitely get development from Carnal Flower and Tubéreuse Criminelle, as well. Fracas I admire from a distance, but wearing it almost always makes me want to call an exorcist eventually. I can’t wear Fracas or Carnal Flower, either, as much as I love smelling them. To me, the big difference between those fragrances and Figment is how deconstructed Figment is. It’s a different sort of tuberose altogether. Lol Erin! I love ‘ the droning eventually becomes suspicious.’! Well said. ???? I found Estee’s Private Collection Tuberose Gardenia more nuanced and longer lasting. I guess what works -works! “I guess what works–works”–yes! And it can vary by person. Lucky you, though, because you save money with a love of Private Collection Tuberose Gardenia. It’s true–it doesn’t change a lot. And now I’m going straight for the Rufus Wainwright comment: I agree! I love the songs, I love the aesthetic, I can’t stand the droning. Only tried this once, and didn’t like it one bit. I’m not as charmed by recent Amouages as you have been, although I did very much enjoy Myths Woman. Gorgeous bottle though. I admit that I only sampled Bracken Woman once, and I somehow passed over Interlude altogether. I did like Myths Woman, though. Yes, I did try the Naomi Goodsir! It’s a real shapeshifter, going from tuberose (ash) to leather to the phenolic smell of Bakelite. I really liked it and need to spend more time with my sample (which I know is around here somewhere). Good for you, Angela! Beloved is exceptionally beautiful and wearable. I’ve been evangelizing the heck out of discounted Beloved over the last year. It might have been you who pointed it out to me! I had to look up the term “jolie laide”…..LOL! Great review as always! I shall be seeking out a sample soon! Isn’t jolie laide a great term? That’s where real beauty lies, in my opinion. Agreed. I’ve been noticing that the older I get, the more I find beauty in the unconventional, and the more beauty I find. I can find the shape of somebody’s eyebrow simply captivating. I’ll never come to grips with Figment not being a fig perfume. The packaging looks really beautiful, though. I know what you mean. It should be fig and mint! Amouage is not really on my radar, but now I am sorely tempted. That blue bottle is beautiful, and I’m on a tuberose jag at the moment. I really like Gucci Bloom. It’s worth a sniff and testers seem to be everywhere at the moment. It’s a curse to be sorely tempted by Amouage! It’s so expensive. But if you love tuberose, it’s worth trying. I’ll look for Gucci Bloom, too. It’s funny, I saw the announcement of this set and thought, “Well, Figment has to mean fig. Which means a Big Fat NO for me,” and so promptly ignored all the splits. But I have been reading reviews recently that suggested I should maybe sample this one. I do love tuberose, but I’m not sure I need a deconstructed one (or even another one at all, since I am stocked up on BWFs!). I am put off by the “earthy, truffled” note you mention; I don’t do well with that sort of thing. I thought I’d love Myths Woman, but I don’t. It’s nice… but, as a contrast to PdF Le Temps d’une Fete which it resembles to some degree, and which I adore, it’s merely nice. Not three-Benjamins-worth nice. To me, Figment isn’t a straight take on tuberose, so it may not appeal to you as much. That said, if you’re ever walking by a tester, do try it! You never know. Le Temps d’une Fete takes the pretty side of narcissus and Myths takes the seamier side–or so I see it. Fortunately, the seamier side works for me. But, yes, “three-Benjamins-worth” has to be pretty fabulous!